← I like to move it move it ! “Biryani avec Poulet” or “Chicken Biryani”; “Naan au fromage” or Cheese Naan ; never had Indian food felt so haute cuisine like it did at Taj Mahal Restaurant. As we glanced the menu, we could not help but overhear a group of South Asian teenagers sitting at the next table . They spoke a mash of Hindi and French. I have heard and used a compound language (Hindi and English) called “Hinglish” but “Frendi” was alien to me. Our day trip started from Tana Jacaranda hotel at Isorka. The Heart shaped, Lake Anosy was less than five minutes away from the hotel. The lake had Monument aux Morts, a memorial for Malagay soldiers who died in First World War. Jacaranda trees and a slum surrounded the artificial lake. Analamanga hill, which housed Manjakamiadana palace at its zenith, is to the southwest of the lake. 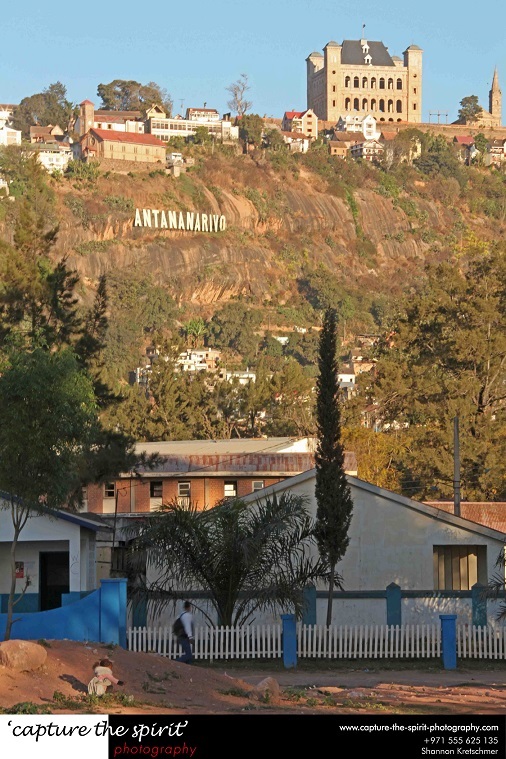 A large sign, ‘Antananarivo’ in style akin to ‘Hollywood’ from Los Angeles, rested on a ridge of the hill. The sign overlooked the lake. The signage made one feel that the city was part of a movie. 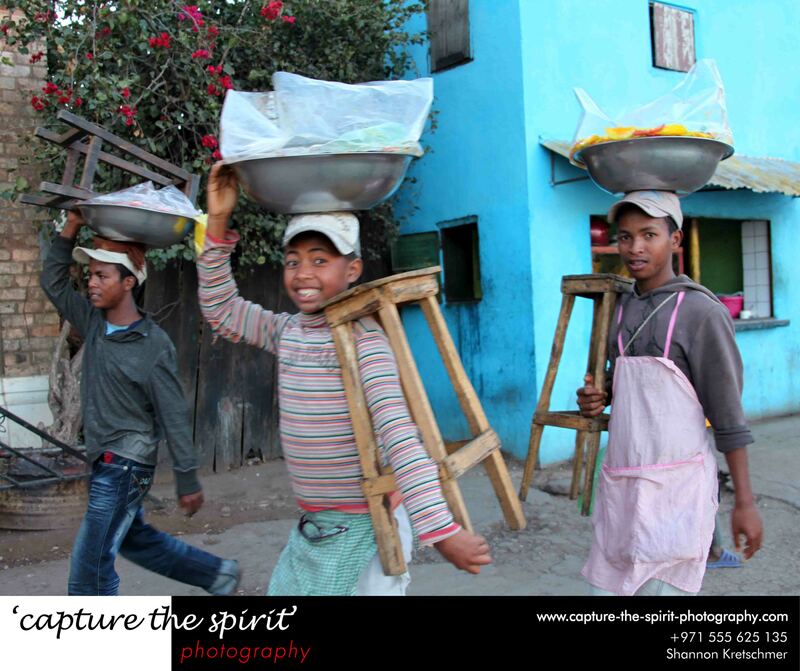 Movie Antananarivo was of course full of its colourful people, who did not look like Africans or Europeans. The locals looked a lot like the country’s first settlers who came from the South East Asian island of Borneo. And the stately villas reminded one of Europe but the climate was more equatorial. “Vanilla…and spices” yelled a street urchin approaching us as we strolled towards dusty and paper-littered Garden of Antaninarenina. 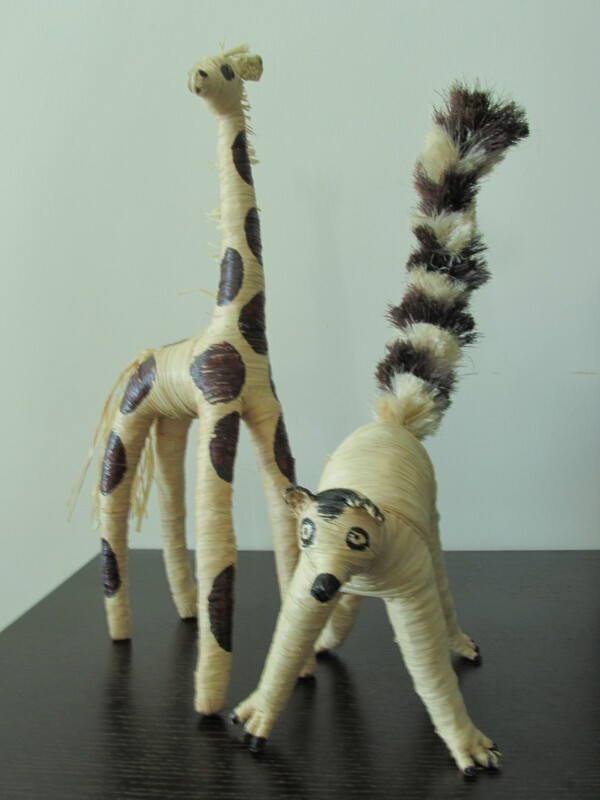 Another one wanted to sell me pictures of unique flora and fauna of Madagascar. “Just 10 Ariary” he proposed. I declined with a smile but they persisted. I wondered why no one hounded my white, Australian friend, Shannon. “Don’t make any eye contact, and keep moving,” he advised. I did exactly as instructed. The cold-shoulder trick worked! Like a Stock Market, the staircase climbed down and then up and ended at Analakely Market. On our descent , we could see the French-styled houses of Analakely Borough. Towards the top-end of the steps, air was muffled with stench of stale blood. We realised that the butchery was right across the road in Analakely Market. The next thing, I saw was baguettes placed in open wooden crates, amidst the clamour of people and vehicles. Besides that, there were rows of more spices, beans, fruits, vegetables, fresh and dried fish, all possible food, household and personal items. To the west end of the market was a mile long Avenue de L’independence , it was a boulevard with several palm and floral trees. Numerous cafes and pizzerias dotted both sides of Avenue de L’independence, which had Soarano Train station at its north west end. 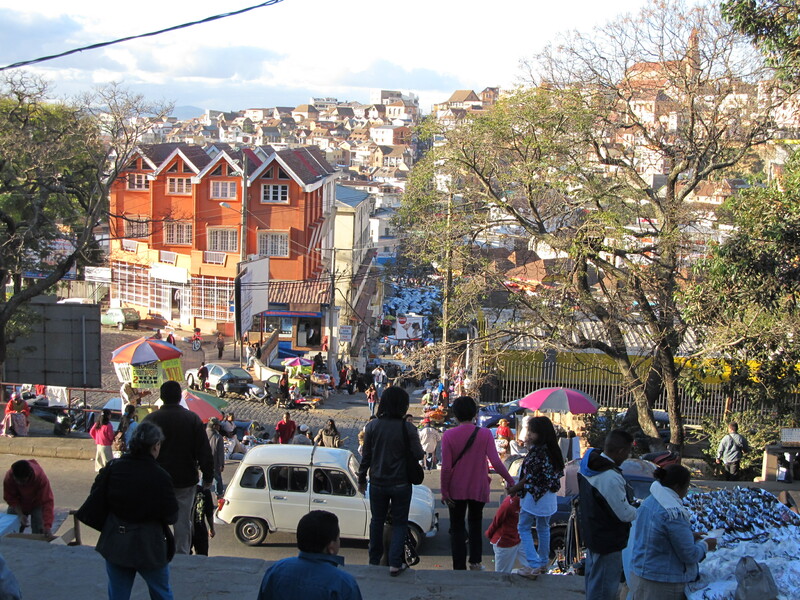 A road called Indira Gandhi Road (named after India’s first female Premier) branched off from the boulevard, to Tsaralalana borough, Antananarivo’s Indian locality. Taj Mahal Restaurant was in that locality. As I dug into the last morsel of Butter chicken, I pondered over our short trip to Madagascar. The nation had showed us an Africa beyond the Big Five (African Lion, Cape Buffalo, African Elephant, African Leopard and Black/white Rhinoceros). Africa has psychedelic geckos; awe-inspiring lemurs; David and Goliath of Chameleons; and many more natural marvels. 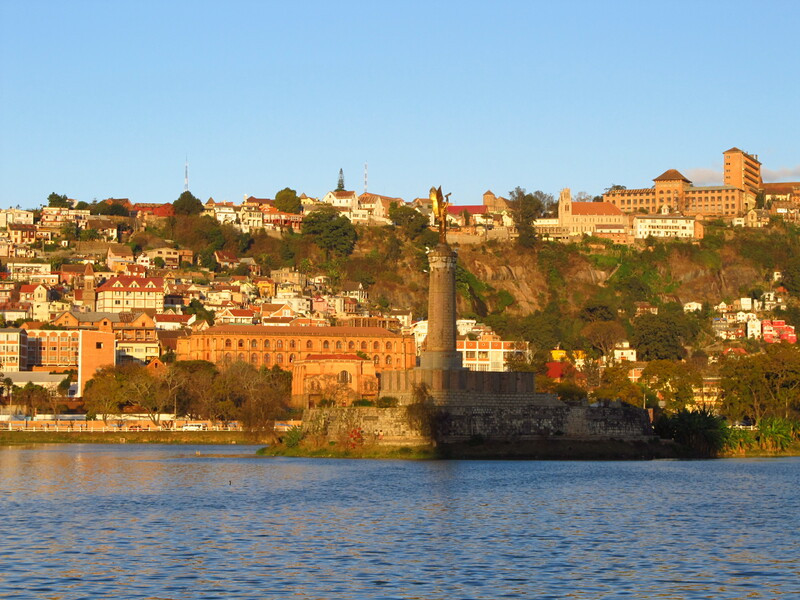 This entry was posted in Travel and tagged #Analakely, #anosy, #Ariary, #avenue, #butterchicken, #Garden, #hollywood, #independence, #Lake, #queen, #queenranavalona, #stairs, Antananarivo, Madagascar. Bookmark the permalink. Your articles are getting interesting,day by day.Keep going. A traveler learns more quickly than others as he encounters the realities while enjoying his exposures. well said…that’s why the journey is more important than the destination! Its an interesting account of the travel ! Loved the Frendi (?) but the cold shoulder trick works no more in India …the pic with the toothy smile of the young street vendor is beautiful .. and Zebu looks a little aggressive ! Thanks Kokila, true the competition is fierce in India,hence the hawkers have to turn up their aggression…I am glad you liked the pics will ensure that the pics are larger the next time…Thanks a lot for taking your time out for the feedback!